When my wife Kat and I were beginning our lives together, we didn’t know much, but we did know we wanted to live in a city. Suburbs are fine, but they weren’t for us. Growing up in the Northern Virginia suburbs around DC, we’d both had our fill of hour-plus commutes, shopping solely in strip malls, and being too far away from any culture or commerce to get there without a car. I can share the love I have for my adoptive city with my daughters in a way I couldn’t do when they were babies. I bring them along with me as I live my everyday City Dad life: running errands, having fun, and participating in public meetings. One regular errand is our weekly trip to the comic book store. I’ve always loved reading comic books, and one of the best shops I’ve ever been to is Velocity Comics on Broad Street. If you’re a comic book nerd, you know that New Comic Book Day is Wednesday – that’s when the week’s new comics arrive at comic shops across the country. When my girls were smaller, I’d walk to the shop during my lunch break on New Comic Book Day. Now, I’m patient so that on the weekends, my daughters and I can take the bus to the store together. The kids love the bus. Not just the riding, but the whole experience. In the morning, we look up the schedule together and decide what time we’ll try to go. As we get close to that time, the girls remind me that it’s time to leave, and we walk to the bus stop. There’s a bench at our stop, but the girls are normally too jumpy-excited to sit on it, and when the Route 24 bus comes into view around the corner, I have to remind them to get back from the curb. They’re that eager to get on the bus. When they board the bus, my daughters are practiced in saying, “May I have the children’s fare, please?” and then they each swipe their fare card.2 They choose our seats (usually the ones in the back because sideways seats are novel), and we’re on our way. The girls love looking out the huge windows and not having to be strapped in. As we get nearer, I tell one of them when to pull “the thinger” (that would be the pull-cord) to let the driver know when we’d like to get off. We get off and walk the remaining block or so to Velocity. In some kind of scheduling miracle, after we’ve picked up our comics and have done a little bit of browsing, it’s time to cross Broad Street and catch the bus home. We play “Who can see the bus number first?” as we wait for the 24. 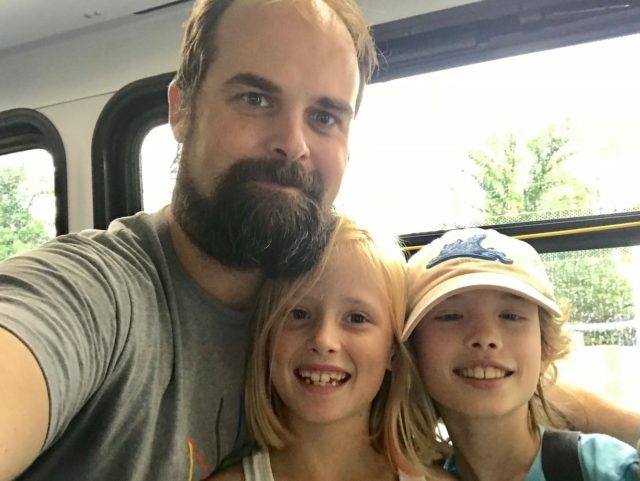 The kids shout out the numbers, and I say “That’s the 6 – it’ll take us to Willow Lawn,” or “That’s the 4 to Carytown,” or “That’s the 3 to Maymont.” I want them to learn just how much of the city is at our disposal without having to have a driver’s license. As we ride the bus home, I’d like to say the girls are just as excited as on the trip down, but usually, they spend the entire trip with their noses in a My Little Pony comic. When it’s time to pull “the thinger,” I nudge the daughter who didn’t get to pull it before, she pulls it, we get off the bus, and we walk home having earned our city life points for the day. We own a car; we could have driven; and honestly, parking isn’t that hard in our city, but I want to show my girls a different way. them a bus pass, and they’ll be trusted to have somewhat free rein of the city. I want them to explore on their own. I want them to have their own errands to run. I want them to feel empowered about how much they can accomplish without needing my help (but knowing I’m just a phone call away if they do). In suburbia, that first taste of liberty comes with a driver’s license. In the city, it can come much sooner (and cheaper) with a bus pass. I don’t expect my kids will end up liking all the things I like. But I want to show them the things I love, and why I love them. That’s one of the greatest things about being a parent: showing humans you love the parts of the world you love even though, eventually, they may see otherwise. My girls will have different priorities than me. They may end up choosing to live in the suburbs, and that’s okay. I’ll still come visit them. I hope they take away that their dad made a deliberate choice in his residency, and that loving where you live can make your life much more satisfying. 1After walking to a restaurant, I say to myself, “That’s it? !” like the little boy in the Circuit City commercial returning a yellow Walkman. 2I get each of the girls a $10 GRTC Go Card from our local drug store. Previous articleOnce a C-Section, Always a C-Section?